A large number of people travelling abroad each year suffer serious injury as result of an accident that wasn’t their fault. Holiday companies have a duty of care to their customers’ to ensure they are safe and that they are not exposed to the risk of injury, disease or infection but sadly this duty of care does not always happen. 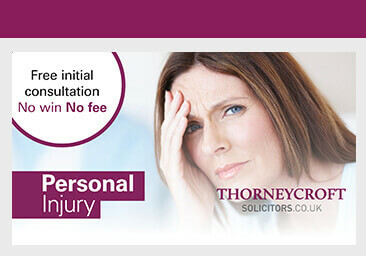 Thorneycroft Solicitors is one of the UK’s leading personal injury solicitors. We have a specialist team who are experienced in handling holiday accident compensation claims and who have a wealth of experience and knowledge across a wide range of accidents whilst on holiday and holiday illness claims. We can help you with road traffic accidents, tripping on defective paths, food poisoning, passenger accidents and sports accidents. If a package holiday is booked in the UK and you or any member of your family are injured abroad, a civil claim can usually be pursued here against the travel company. The claim for your accident abroad will include compensation for any injuries and illness suffered, loss of enjoyment for you and your family, loss of income due to any time off work and additional costs incurred to help with medication and rehabilitation.